Decca Gold is a new imprint, very recently launched by Universal Music Group. It’s a US label which is intended “to serve as the permanent American home for all new classical artists”. 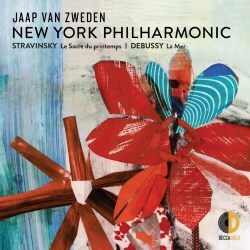 One of the new label’s partners will be the New York Philharmonic and among the initial batch of releases is this coupling of two twentieth-century masterpieces in which the orchestra is conducted by their Music Director, Jaap van Zweden. Mr van Zweden took up his post at the start of the 2018-19 season. It’s not entirely clear from the booklet that these are live performances but because an acknowledgement is made to sponsors of the orchestra’s concerts on 4-6 October, I infer that these are live recordings made at concerts given in the opening weeks of van Zweden’s tenure. Has Le Sacre lost its power to shock? That question ran through my mind when I first encountered this van Zweden performance during the most recent session in the MusicWeb International Listening Studio and it returned as I listened in full to the performance at home. Orchestral standards have risen to such heights nowadays that orchestras seem to think nothing of the challenges of Stravinsky’s radical masterpiece. Indeed, many youth orchestras are more than capable of giving highly assured performances of the work. A while ago I reviewed one of the very earliest recordings of Le Sacre, made in January 1929 by the Orchestre Symphonique de Paris under Pierre Monteux, the very first conductor of the work. As I commented then, “In this imperfectly played and imperfectly recorded account we get more than a sense of the demands that this score, which must have seemed outlandish at the time, made on its early players.” There’s none of that sense of strain here: the playing is very fine indeed and the recorded sound is equally good. And yet, I came away from this recording wanting more. The opening is promising. In ‘Introduction’ the copious strands of the woodwind lines are laid out with great clarity thanks to the superb accuracy of the NYPO and the fidelity of the recording. However, when we get to ‘Jeu de rapt’ it seemed to me that the music, whilst powerful, couldn’t be described as brazen. ‘Rondes printanières’ depicts a stately ritual but that’s only part of the story, surely; I don’t feel any sense of apprehension. In the passage beginning at tr 4, 2:15 the great percussion crashes and brass glissandi are potent but not savage. I took down from the shelves the 1999 recording – also live, I believe – made by Valery Gergiev and the Kirov Orchestra (review). Within a very short space of time I could hear the edge and savagery missing from the NYPO account. Gergiev makes the climax of ‘Rondes printanières’ truly elemental. In ‘Jeux des cites rivales’ van Zweden sounds smooth compared to the jagged urgency of Gergiev’s performance. At the end of Part One, in ‘Danse de la terre’, the New York performance is forceful but didn’t have me on the edge of my seat. Turn to Gergiev and the music seems to lift savagely off the page. His percussion is so exciting – even more so than the excellent New Yorkers – and his electrifying performance generates huge tension; it’s frightening in its intensity. The very end of Part One is a trifle untidy in the NYPO performance; part of the orchestra – the horns, I think – are fractionally late coming off the last chord. The opening of Part Two goes well under van Zweden. The performance is well controlled, as is the playing. The recording reports the orchestral textures very successfully. The violently percussive dance in ‘Glorification de l’Élue’ is articulated with power and precision by the NYPO. However, Gergiev’s rendition is alarmingly intense and you can hear even more in the underneath parts. His delivery of ‘Évocation des ancêtres’ is taken at a broader pace than van Zweden adopts and has earth-shattering power. The concluding ‘Danse sacrale’ is powerfully projected by the New Yorkers but I feel the performance is just a bit too contained. Gergiev, by contrast, whips the music into a visceral frenzy. I think that had I heard the van Zweden performance in the concert hall I would have gone home feeing well satisfied. However, despite the excellence of the NYPO’s playing, I can’t honestly say that this performance really stands up to the scrutiny of repeated domestic listening. Gergiev’s explosive, superbly played account brings out all the primitive savagery and compelling originality in Stravinsky’s score. I fear that it puts the van Zweden version completely in the shade. Happily, matters are rather better in La Mer. In the slow introduction to ‘De l’aube à midi sur la mer’ van Zweden establishes a fine sense of atmosphere. This first section (to 4:43) is very well handled indeed and the care for textures and balance carries on throughout the movement. The depiction of midday is majestic. ‘Jeux de vagues’ is light-footed; the music swirls evocatively. The playful capriciousness of Debussy’s white-top waves is well brought out and the performance is full of light and shade. ‘Dialogue du vent et de la mer’ opens strongly (to 1:27); the gusts of wind are readily audible. By contrast with the previous movement, the waves and currents are more potent, which is as it should be. In this movement Debussy evokes both the turbulence and the majesty of the sea; van Zweden and the NYPO depict all this vividly. It’s an excellent performance. If the account of Le Sacre had been as vividly characterised as the Debussy performance this disc would have stronger claims on the attention of collectors but, to be honest, there are far more compelling versions of the Stravinsky on the market. This, however, is to take nothing away from the high quality of the playing of the NYPO. The recordings have been engineered by Lawrence Rock, the orchestra’s Audio Director. The recordings are a bit close, though not oppressively so and the results have clarity and impact. The booklet is satisfactory: I can’t help noticing that the music is dealt with in just three pages of notes whereas eight pages of the booklet are devoted to the artists.